There’s a movement in LA and YOU are part of it. There are two phrases in Metro’s new “Join the Movement” initiative that resonate with me personally. We refuse to accept the bottlenecks of the past and we refuse to be labeled a car culture. Those two sentences perfectly distill why we’re working to transform transportation all across LA County. Our Metro Vision 2028 Strategic Plan is our roadmap to provide more mobility options than ever before and enhance communities through access to opportunities by ensuring that we consider everyone in LA County in all we do. In the process, we stand to elevate our region as the Transportation Center of Excellence. Implement mobility innovation. Our partnership with the private sector is an important tool to provide better mobility in a timely manner. Our Office of Extraordinary Innovation is negotiating with a private firm that seeks to build an aerial tram between Union Station and Dodger Stadium, and pursuing public-private partnerships to finance and possibly accelerate major projects, such as the West Santa Ana Branch Transit Corridor and the Sepulveda Transit Corridor projects. Capture the hearts and minds of the people. We are striving to deliver outstanding trip experiences to all customers. We plan to launch our revamped and improved bus network in late 2019 through our NextGen Bus Study. Metro’s partnership with the Long Beach Police Department, Los Angeles Police Department and Los Angeles Sheriff’s Department has helped reduce serious crime on the system and improve response times. Other improvements are planned to keep our system safe, attractive, easy and pleasant to use. Embrace equity. Our new Equity Platform moves equity to the forefront of decisions we make about transportation. Equity is about smarter planning, an increased commitment to environmental justice, more targeted public outreach and pushing for transit-oriented communities to improve access and economic opportunities for everyone in LA County, especially communities that have historically been left behind. Foster continuous improvement. Our agency must continue to provide responsive, accountable and trustworthy governance. This means that best practices and lessons learned are always guiding principles and that we remain excellent stewards of taxpayer dollars. We make sure that small, disadvantaged, veteran and women-owned businesses help us deliver our projects and services. We recruit people to our industry and provide them with a career pathway and ensure all 11,000 Metro employees contribute to providing a world-class transportation system that enhances quality of life in LA County. Step into leadership voids. Transportation is the instigator of so many things. We can use our projects to help tackle many issues that hold communities back — such as helping cities build and fund more affordable housing. We are working to connect homeless with social services. And we can help lead the way on economic development through our work to attract a rail car manufacturing facility to LA County and our efforts to reimagine Union Station as the type of transit hub that will be an economic force for the unforeseeable future. As you leaf through this annual report of our accomplishments in 2018, think about how these efforts will leave imprints on our regional transportation system for decades to come. We are truly creating an infrastructure inheritance for our children and grandchildren. We are refusing — in every sense of the word — to accept the bottlenecks of the past. We are the movement. And our time is now. Thank you for your interest, your support, and for joining the movement. We will not stop and go. This last year was a busy one for Metro: new service launches, a historic bus network study, and key safety and customer care improvements set the course for a mobile new year. A better bus network Every day, we hear your comments about how Metro’s buses can better serve you. We’ve listened. Now we’re taking action. This year, Metro began the process of reimagining and restructuring our bus system with the launch of the NextGen Bus Study. The goal of the study is to design a new bus network that is more relevant, reflective of and attractive to the residents of LA County. We believe this redesigned network will improve service to current customers, attract new customers and win back past customers. Lots of community meetings, focus groups and customer feedback meetings have already occurred with more planned in the coming year. Launch date is December 2019. Speeding up your journey This year, Metro expanded all-door boarding on the busy Wilshire Bl Metro Rapid Line 720 and the heavily traveled Vermont Av Metro Rapid Line 754, to speed up transit trips and reduce the time buses dwell at bus stops. Metro Rapid Line 720 service along Wilshire Bl — which is the busiest line in the system — carries close to 30,000 boarding passengers on an average weekday. All-door boarding on these two popular lines has helped improve on-time performance by allowing riders to enter the bus from all doors and use their TAP card for fare payment. New in the Valley Metro launched its new shuttle service in the Warner Center area, making it much more convenient for the public to access numerous destinations at San Fernando Valley’s largest business development park. Line 601, the Warner Center Shuttle, provides 10 new area bus stops and runs every 10 minutes throughout the day. Buses operate seven days a week. Riders now have direct access to Westfield Topanga, The Village, Warner Center Corporate Park, Kaiser Permanente Hospital and other locations. Metro is committed to giving Angelenos a faster, more convenient connection to important destinations, and this new shuttle service will provide riders a convenient and sustainable way to travel to one of our region’s most vibrant economic hubs. Dodger Stadium Express bus service has transported more than two million fans since beginning in 2010. Go Metro to the Dodgers The Dodger Stadium Express bus service provided baseball fans with a fast and convenient way to get to Dodger Stadium again this year for all preseason games, regular home games and postseason games, including this year’s playoffs and the 2018 World Series. The service has transported more than two million fans since beginning in 2010. Metro’s system provides easy, convenient connections to get people to both Union Station and Harbor Gateway Transit Center, where they can then benefit from this direct service to Dodger Stadium. It’s a great example of how our overall system provides transit options to enhance the customer experience. Safer crossings A key Metro project to increase pedestrian safety at 27 Blue Line street crossings was completed this year. Construction of the project began in 2015 in Long Beach and continued north. Among the upgrades made were pedestrian swing gates and crossing gates, new and wider walkways, new continental crosswalk pavement striping, ADA curb ramps and roadway improvements and installation of improved signage. The project investment? $31.5 million. These new improvements will make the Blue Line safer to access and bring the line up to the latest standards found on other Metro light rail lines. Tying together connections Progress was made in connecting the Crenshaw/LAX Transit Project with the Green Line. Metro staff and the Crenshaw/LAX Transit Project contractor, Walsh Shea, were able to complete the tie-in work ahead of schedule to get the Green Line stations back open as soon as possible. Connecting the Green Line with the Crenshaw/LAX Transit Project marked another big step in the expansion of Metro’s transit network. Speaking your language Making sure that every Metro rider can easily provide us with feedback, Metro developed a multi-language comment and complaint form for online users, giving agency customers with a limited proficiency of English a more effective way to communicate with the agency. As part of Metro’s Limited English Proficiency (LEP) Policy, staff can now respond to online inquiries in nine languages: Spanish, Chinese, Korean, Vietnamese, Japanese, Russian, Armenian, Thai and Khmer. Happy birthdays! Metro celebrated the 25th birthday of the Red Line in 2018. Numerous elected officials and community stakeholders joined Metro for the celebration. The popularity of the subway system sparked a renaissance of rail planning and construction in LA County that now spans 105 miles of Metro Rail, with four new projects currently under construction. The launch of the Metro Red Line back in January 1993 signaled the beginning of the construction of a modern day state-of-the-art underground transportation system that today serves as the backbone and workhorse of the entire rail and bus network. Over the last 25 years, the Red Line has carried an estimated 817 million passengers who traveled approximately 3.6 billion miles. The Red Line currently has more than 140,000 boarding passengers on an average weekday. Metro also celebrated its 25th anniversary as an agency. Metro was created in 1993 by merging the Southern California Rapid Transit District (RTD) with the LA County Transportation Commission (LACTC) to form the Los Angeles County Metropolitan Transportation Authority (Metro). Please, be super kind. In Fall 2018, Metro launched a second round of “Super Kind” Metro Manners videos, an online and print campaign to continue raising awareness about proper transit etiquette onboard Metro buses and trains. The videos are developed in the popular Japanese anime style, and feature Super Kind — the heroine who takes Rude Dude to task for his bad behavior. The campaign takes a light-hearted approach to educating riders about three additional etiquette and Customer Code of Conduct issues that are a nuisance on the Metro transit system: playing loud music, vending and not allowing customers to exit the train before boarding. Five years of faster The Metro ExpressLanes celebrated their fifth anniversary in 2018 with a weeklong celebration of the successful ExpressLanes along the I-10 San Bernardino Freeway. Since the inception of the Express-Lanes, more than 195 million trips have been taken with 125.4 million occurring along the I-110 ExpressLanes and 69.9 million on the I-10 ExpressLanes. A total of 702,500 accounts have been opened, including 17,049 Low-Income Assistance Plan accounts. High-tech safety This year, Metro partnered with the Transportation Security Administration (TSA) to deploy a new advanced portable passenger screening technology that will help detect weapons and explosive device security threats on the Metro transit system. Metro is the first surface transportation agency in the nation to purchase such an advanced, high-tech security device to help keep transit riders safe from person-borne, improvised explosive devices or other weapons that are intended to cause mass casualties. Moving the masses Early this year, we were well prepared for the return of the Women’s Day March. Metro added the necessary service to get participants where they needed to be in downtown Los Angeles. With 200,000 attending, Metro planned extra rail service and security for the event. Connecting to your flight Metro, Metrolink and airport officials celebrated the completion of a new Metrolink Antelope Valley Line Rail Station that connects travelers with the Hollywood Burbank Airport in the San Fernando Valley. The station helps reduce vehicle trips on the I-5 freeway and roads in many of the residential neighborhoods near the airport. Air travelers are now able to seamlessly connect to and from the new station via a free shuttle operated by the Hollywood Burbank Airport. A plan for parking Metro’s Board of Directors approved an innovative new parking master plan that will help ensure transit customers find parking at Metro transit stations. The plan provides the blueprint for more effectively managing parking demand at Metro’s 70 Park & Ride lots that together provide more than 24,000 parking spaces within LA County. The number of parking spaces on the Metro system is expected to grow to 31,500 by 2029 as new transit lines now planned or under construction become publicly available. Through the employment of new policy, technology, enforcement and operations recommendations, Metro will ensure parking remains expressly available for transit customers, specifically at the highest demand Park & Ride lots. Watch out, Uber and Lyft Microtransit is coming! This year, the Metro Board of Directors approved contracts totaling $885,247 to three vendors — RideCo, NoMad Transit and Transdev — to plan and design Microtransit, an on-demand, shared-ride transit service scheduled to launch in 2019. The service will offer current and future Metro customers the ability to use cell phones to order, pay for and monitor the status of their pick-up and drop-off in smaller Metro vehicles. The service will not be tied to a fixed route or schedule. Instead, Metro customers will be able to request a ride when they need it in real time. The new service will initially be deployed in smaller zones throughout the county to determine customer demand and financial viability. Metro is also close to launching a limited Mobility on Demand pilot program with a $1.35 million grant from the Federal Transit Administration’s Mobility on Demand program. Metro will be partnering with ride-sourcing company Via to provide a new way to access three key Metro stations — North Hollywood Station, Artesia Station and El Monte Bus Station. Metro and Via have designed this mobility option with the goal of ensuring that the service is accessible to all of Metro’s customers. The service will be affordable, and customers will have the option of dispatching the ride from a smart phone app or through a call center. We are dreamers and makers. With construction progress on three rail lines and a deep bench of future project studies underway, Metro is planning and making LA’s future. Ready to welcome the world With the Olympic and Paralympic Games coming to the LA region in Summer 2028, Metro continues to work on a “Twenty-eight by ’28” Initiative to ensure that 28 key road, transit and bicycle/pedestrian projects are completed in time for the 2028 Summer Games in Los Angeles. Many of the projects are already scheduled to be completed by then. Others would need accelerated funding to be completed by 2028. The 2028 Olympic and Paralympic Games offer an opportunity for us to work with state and federal governments to move our projects forward for the benefit of people in our region. Big doings in the Valley Ground has been broken on the Metro Orange Line Improvements Project, which will improve bus speed and safety, and prepare the bus rapid transit line in the San Fernando Valley for a future conversion to light rail. The project will build two aerial bridges and stations, as well as bike and pedestrian path grade separations at Van Nuys Bl and Sepulveda Bl — two of the line’s busiest crossings. Metro will also build four-quadrant crossing gates at up to 35 intersections between North Hollywood and Chatsworth. Another key improvement will integrate better traffic signal priority technology for buses to improve travel times along the 18-mile corridor. Altogether, the project could achieve a 20 percent reduction in trip times, increase ridership by 39 percent and virtually eliminate the potential for vehicle intrusions onto the busway, while improving safety for buses, cars, pedestrians and bicyclists alike. The work is set for completion in 2025. Marking a historic transit milestone for the San Fernando Valley, Metro’s Board of Directors approved light rail as the official technology for the East San Fernando Valley Transit Corridor Project that will connect the Metro Orange Line Station in Van Nuys with the Metrolink station in Sylmar/San Fernando. A tram to the ballpark Metro received an unsolicited proposal from Aerial Rapid Transit Technologies LLC (ARTT) to build an aerial tram that would carry passengers between Dodger Stadium and Union Station. Metro’s Unsolicited Proposal policy allows the private sector to submit ideas to improve Metro projects, programs and services. Metro is currently negotiating with ARTT to develop the project. Connecting the Valleys Efforts are underway on the North Hollywood to Pasadena Bus Rapid Transit Project. Several community meetings have been held to gather input into the project’s current planning and its environmental study. The $267 million project aims to build a high-quality bus rapid transit (BRT) line that will connect the San Fernando and San Gabriel Valleys. Metro anticipates that the project may ultimately span 16 to 18 miles and will travel east-west between the North Hollywood Station and a location to be determined in Pasadena. The project is scheduled to open between 2022 and 2024.Metro is currently studying the North San Fernando Valley Bus Rapid Transit Project. The $180 million project will build a high-quality BRT line in the North Valley that will connect major activity centers, employment sites, education and regional transit connections. Metro anticipates that the project may ultimately span 18 to 20 miles and will travel east-west across the northern San Fernando Valley, potentially connecting to the East San Fernando Valley Transit Corridor Project, the Chatsworth Metrolink Station, and either the North Hollywood Metro Orange/Red Line Station or the Sylmar/San Fernando Metrolink Station. The project is scheduled to open between 2023 and 2025. Big doings underground In a major milestone for construction of Section 1 of the Purple Line Extension Transit Project, Metro has begun tunneling work underneath Wilshire Bl and La Brea Av. Twin tunnel boring machines (TBMs), named Elsie and Soyeon, will tunnel parallel underground sections between the future Wilshire/La Brea Station and the current Wilshire/Western Purple Line terminus. The TBMs each weigh 1,200 tons, are 450 feet long, have a diameter of 21.8 feet and will simultaneously be excavating approximately 60 feet per day in the twin tunnels over the next two years. The official groundbreaking for Section 2 of the Purple Line Extension Transit Project took place earlier this year. Section 2 will add 2.6 miles of new subway service to downtown Beverly Hills and Century City. Metro has begun moving underground water, gas, power and telecommunications lines to make way for future subway construction. Major construction activities are underway for a launch area for a tunnel boring machine at the planned Century City/Constellation Station. Work at the planned Wilshire/Rodeo Station in Beverly Hills is expected to begin in early 2019. Section 3 of the Purple Line Extension Transit Project moves forward, as the Federal Transit Administration (FTA) has approved Metro’s request to be reimbursed for early work activities for the section between Century City and the Westwood/VA Hospital. The approval also clears the way for Metro to take advantage of highly competitive tunnel contract bids, which have come in lower than expected and would save the project an estimated $130 million. FTA’s actions mark an important step in the path to ultimately secure a $1.3 billion Full Funding Grant Agreement for Section 3 through the FTA’s New Starts Program. Metro is hopeful a grant agreement will be forthcoming in early 2019. More than 400,000 people commute through the project study area every day. Charting the next missing link This year saw the first in a series of community meetings for the Sepulveda Transit Corridor Project. 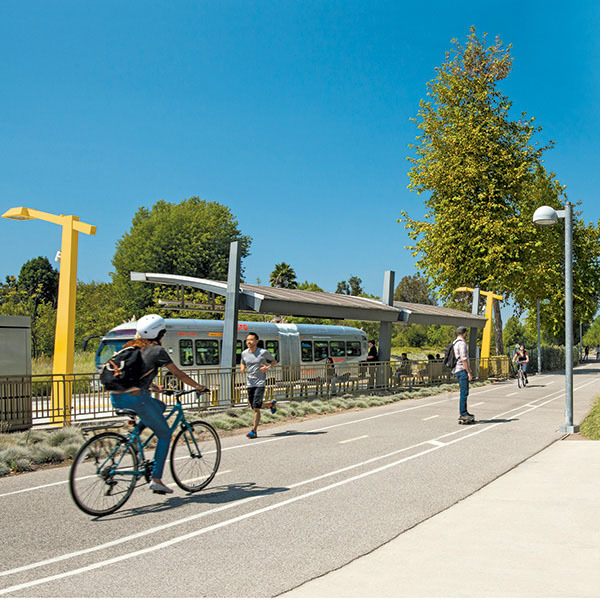 Metro is conducting a feasibility study to identify and evaluate a range of rail transit alternatives between the San Fernando Valley and LAX, including connections to existing and planned bus and rail lines such as the Metro Orange, Purple and Expo Lines. Several alignments and station locations will be considered for the alternatives. The study is expected to conclude in the summer or fall of 2019. More than 400,000 people travel through the project study area every day to commute to work, school and other destinations along the freeway and beyond. The first phase of the project between the Valley and the Westside is scheduled to open in 2033. Metro is considering a public-private partnership to expedite the project. Progress in the South Bay Construction continues on the Crenshaw/LAX Transit Project with nearly 90 percent of the project now completed. The contractor is continuing critical underground work on station structures, track systems and testing activities. The line’s Southwestern Yard facility is nearing the finish line in early 2019. The Green Line Extension to Torrance Project is moving forward into the environmental phase. The project includes a 4.6-mile extension from Redondo Beach south to the Torrance Transit Center currently under construction by the city of Torrance. Two route alternatives will be carried forward in a more comprehensive environmental study. Groundbreaking is set for 2026 with completion in 2030–33. There’s a new movement in LA And every-one is part of it. One of Metro’s goals is to refresh the Metro brand by helping people see themselves in Metro and all we’re doing to enhance mobility and lives. The centerpiece of the Join the Movement campaign began in late 2018 with television ads, and then expanded through social media. It’s critical that we connect people to the movement that Metro is leading across the county — and the country. Everything we do here at Metro is part of “the movement,” whether it be career opportunities, construction projects, our NextGen Bus Study, creating transit-oriented communities and — our core business — moving many thousands of people safely every day. Digital Customer Information Program Metro is taking a big step in enhancing customer experience by installing digital information displays at rail and bus rapid transit stations. This effort is part of the two new advertising contracts that were approved by the Metro Board in 2018 — one for the rail system and one for the bus system. The contracts will increase revenues generated by advertising across Metro’s system, while improving our ability to share customer information with our riders. Metro will transition from static map case displays to digital customer information panels at rail and BRT stations that can deliver customized information and a variety of maps to riders in real time, while also showcasing revenue-generating ads. Additional new digital kiosks, dubbed LinkLA, will provide Metro customers with free Wi-Fi, phone calls to anywhere in the U.S., emergency 911 calls, USB charging and an interactive tablet that offers access to wayfinding, city services and local information. Metro Rail/BRT Naming Convention Metro’s system is growing and changing with eight rail and Bus Rapid Transit (BRT) lines now in operation — and more to come. To make it easier for riders to navigate the system, the Metro Board approved a new transit line naming convention that will pair letters with the line colors to make it easier for riders to identify our various rail and BRT lines. The changes will be phased in over the next few years, beginning with the Blue Line in 2019 as part of the New Blue Improvements Project. This is another way that Metro is working to make the riding experience easier. We are building the change we want to see. A strategic blueprint for Metro, active community engagement in long range planning and foundational refurbishments set our course for the next several decades. We see the future Metro’s big picture plan, Metro Vision 2028, which reflects the strategies the agency plans to use to improve mobility and quality of life across LA County over the next decade, was approved by the Metro Board of Directors. Metro Vision 2028 shifts the agency’s focus beyond just operating transit to managing mobility. This includes ensuring that all county residents have access to high-quality mobility options within a 10-minute walk or roll from home. The plan also strives to reduce maximum wait times for any trip to 15 minutes during any time of day, improving average travel speeds on the county’s bus network by 30 percent, and provide reliable and convenient options for users to bypass congestion. The plan is the result of more than 17 months of research, discussion and outreach by Metro’s Office of Extraordinary Innovation that includes surveying over 18,000 county residents and workers to better understand their transportation needs and concerns. A better Blue Line The Blue Line will undergo a comprehensive $350 million modernization beginning in January 2019 to improve reliability, enhance safety and improve the customer experience. Work to modernize the Blue Line — Metro’s oldest rail line which opened in 1990 — has been ongoing since 2014 with a series of safety and operational improvements. The upcoming New Blue Improvements Project will require portions of the line to be temporarily closed for two extended four-month closures beginning in January. Work on the Blue Line will include improvements to the signaling, tracks and the overhead wires that deliver electricity to trains. Four new crossover tracks will be built to reduce service interruptions. There will also be numerous station improvements, including new digital customer information displays, updated signage, new paint and landscaping. What’s next, LA? Over the last 25 years, tremendous progress has been made in creating more transportation options for everyone who lives, works and plays throughout LA County. There is even more to come as we build more rail lines, improve freeway traffic flow and create more mobility solutions as transportation technology evolves. At the same time, Metro is always thinking long-term. To that end, we launched Our Next LA, a robust engagement effort for Metro’s update to our Long Range Transportation Plan (LRTP). We started with our “listening phase” to solicit and prioritize your hopes for a better LA. Through surveys, pop-up events and a suite of community meetings across the county, we collected input to inform the development of the new LRTP, which was last adopted in 2009. Once approved by the Metro Board of Directors, the LRTP serves as a blueprint for how Metro will focus anticipated revenues in the coming decades. Our current schedule anticipates adopting a new LRTP in the next two years. A train to your plane Finally, a rail connection to LAX! The design of the new Airport Metro Connector Station is about 60 percent complete. The station will be built at Aviation and 96th St. This is the station where Crenshaw/LAX Transit Project and Green Line riders will be able to transfer to the Automated People Mover being built by LAX. The Airport Metro Connector Station will also feature bus bays for local buses, as well as a pick-up/drop-off area. Long story short: it means not having to drive into the very congested airport horseshoe. The plan is to complete the Crenshaw/LAX Transit Project and get that in service — and then begin the work on the Airport Metro Connector Station. The station is scheduled to open in 2023, the same year the airport expects the Automated People Mover to be complete. Reviving a busy hub This past year, major improvements began on the Blue Line’s Willowbrook/Rosa Parks Station. The work will radically transform the fourth-busiest station in the Metro Rail system by improving access, expanding capacity, adding community space and better connecting the station to the surrounding neighborhoods. Among the improvements, the station will have a new customer service center, transit security center and bike hub. The open-air plaza has also been designed as a public resource for community events, special exhibits, celebrations and movie nights. The $109 million improvement project is funded by a combination of local, state and federal grants. Key help from the Golden State The California Transportation Commission (CTC) this year approved the programming of $482 million in State Transportation Improvement Program (STIP) funding that will be used for a variety of transportation projects throughout the region, including the SR-138 Highway Project, the East San Fernando Valley Transit Corridor Project and the purchase of new buses for Metro’s bus fleet. The CTC has adopted the five-year 2018 State Transportation Improvement Program (STIP), which includes $482 million for LA County. The 2018 STIP is a much-needed boost of funding, particularly after the last STIP adopted in 2016 cut $754 million of funding from projects statewide. Working for the future Metro is building the workforce of the future with a career pathway that provides opportunities for people to move into transportation jobs and move up through the ranks. Metro and the whole transportation industry will face a huge challenge in the coming years as the need grows for qualified workers. The groundbreaking Workforce Initiative Now-LA (WIN-LA) program creates career pathways in the transportation industry. A soft launch earlier this year resulted in the first WIN-LA participants gaining employment at Metro in positions of Service Attendant and Bus Operator. Along with the WIN-LA program, Metro has initiated development of a transportation school for high school students. The transportation school is a partnership between Metro and LA County to launch an educational and career readiness program to introduce high school students to pathways in the transportation industry in an effort to create the next generation of transportation workers. The physical school will be built as part of a new development at Manchester and Vermont in South LA and is scheduled to open in 2020. It will be an effort to expose, educate and employ young people as the workforce of the future. The agency’s Women Build Metro LA (WBMLA) committee was established in support of Metro’s Project Labor Agreement (PLA) and Construction Careers Policy mandate. WBMLA is composed of women and men in construction-related industries, community advocates, stakeholders and decision-makers from the private and public sectors. Membership on the committee is open to all who want to work to help increase female participation in the transportation-related workforce. Given that women currently make up less than 3 percent of the construction trade workforce, the voluntary committee members are passionate about increasing female participation. With emphasis on the construction trades, we are proud to recruit, educate and support women’s introduction into all aspects of the transportation industry. Although Metro does not hire workers for our construction projects, all of Metro’s prime contractors have this requirement. In addition, this year the Metro Board of Directors authorized the creation of a score card system to highlight prime contractors’ attainment of female participation goal of 6.9 percent on Metro construction contracts subject to the PLA. Rail car manufacturer The Metro Rail system will double in size over the next few decades. That means we’ll need many more rail cars to keep our lines running. In August, Metro convened a roundtable discussion with rail car manufacturers from around the world to discuss the possibility of locating a full-scale rail car manufacturing facility in LA County. And there’s much interest. While there are other rail car assembly and manufacturing facilities in the U.S., there are none that cover the complete cradle-to-grave lifecycle of a rail car. Such a facility, we believe, would benefit many parties: manufacturers, suppliers, agencies, and the public at the local, state and national level. We listened to ideas from the manufacturers and we’ll continue to explore how we might partner with them to set up an all-encompassing rail car manufacturing facility in Southern California. How women travel Not surprisingly, about half of Metro’s ridership is comprised of women. Our Women & Girls Governing Council was created to assess policies and programs through a gender lens to promote transportation equity. The council is also seeking solutions to reduce the transportation challenges for women and girls to get to jobs, school, healthcare and childcare, while ensuring Metro does all it can do to ensure the safety of women on the Metro system. Key funding protected The state’s transportation funding plan — Senate Bill 1 (SB 1) — prevailed following an attempt to repeal it on the November 2018 ballot. SB 1 will add $182.6 billion and support more than 682,000 jobs across the state in the next decade, according to a new report released earlier this year by the American Road and Builders Association. Metro is set to receive approximately $1.8 billion in state funds under SB 1 that are heavily dependent on SB 1 to help build a variety of road and transit projects, including the Gold Line Extension to Claremont and Montclair, the Orange Line Improvements Project, the West Santa Ana Branch Corridor and the Green Line Extension to Torrance. On the highway side, SB 1 will help fund truck lanes and improvements on the I-5 freeway in the Santa Clarita Valley, upgrades to the SR-71 freeway in Pomona and rebuild junctions of the I-605/SR-91 and the SR-57/-60 freeways. We are leaving the smog and stress behind. Metro’s transportation revolution is making sustainable practices the norm, while also meeting the needs of an increased population and fueling economic growth. In acting as responsible stewards of taxpayers’ trust, the agency is actively thinking boldly and challenging ourselves to provide mobility service in the most environmentally sound and energy-efficient manner possible. Our world-class, innovative solutions not only get Angelenos where we want to go, but also reduce greenhouse gas (GHG) emissions in the process. And this is only the beginning. Sustainability and environmental responsibility are infused into everything we do — planning, constructing, operating and maintaining our infrastructure, assets and human capital. We are expanding our system to provide a convenient, zero-emissions fleet combined with various alternative modes to driving alone. As Metro’s services expand, we are significantly limiting the impact transportation has on the environment. More trips on two wheels Metro Bike Share is a breath of fresh air. Metro has made several major improvements to its countywide bike share program that makes using shared bicycles more affordable and accessible for short-distance trips. Metro also plans to expand its bike share program utilizing new Smart Bikes in several new downtown LA and Westside communities. Smart Bikes do not require ending or starting a trip at a station and do not have to be docked, although designated stations will still be available. Metro’s new fare structure is designed to increase ridership by lowering fares and providing Angelenos with several new fare options. The Single Ride has been reduced to $1.75 for each 30 minutes or less, Day Pass reduced to $5 for unlimited free trips of 30 minutes or less, and Monthly Pass options reduced to $17 per month. Earth Day incentive To encourage environmentally friendly transportation options and attract new transit riders, Metro provided free rides on the entire Metro bus and rail system on Earth Day 2018. The free ride offering is just one way to help reduce the region’s harmful air emissions. Studies show that taking transit instead of driving alone, even if occasionally, is an excellent way to reduce an individual’s carbon footprint, as it reduces the amount of greenhouse gases that contribute to climate change. Rolling out a cleaner fleet Metro’s entire fleet of 2,438 transit buses operate on clean-burning compressed natural gas. The agency has also committed to converting its entire bus fleet from natural gas to all zero-emission buses by 2030. The 105-mile Metro Rail system already operates on electric power. The transportation sector is the largest source of greenhouse gases in California, contributing to 37 percent of the state’s greenhouse gas emissions. The greater LA region has significantly improved air quality but still violates the federal ozone standard at least 100 days per year. Metro plans to have zero-emission electric buses operating on the Orange and Silver Lines in the next two years. To achieve this, Metro has already purchased nearly 100 all-electric buses. Support for car-free events Metro continues to be a leader in funding and promoting Open Streets events throughout the county. Open Streets events are one-day occurrences funded by grants that close public streets to automobile traffic and open them for bicyclists and pedestrians to experience walking, riding a bike and riding transit without having to maneuver around cars. This program is a win-win for the public and the environment and encourages future mode shift to walking, biking and the use of public transit. Metro has awarded $4 million to 15 new Open Streets events scheduled through 2020. Going the extra mile Metro’s Blue Line First/Last Mile Plan, adopted by the Metro Board of Directors earlier this year, is the first of its kind for Metro and other transit agencies in terms of its breadth and the community partnerships involved. Over the last two-plus years, Metro staff, community members and stakeholders pounded the pavement together, walking the many neighborhoods surrounding the Blue Line’s 22 stations. Their goal was simple: identify barriers that make getting to and from the stations more difficult and focus on the improvements needed to make reaching the Blue Line — by foot, bike and transit — safer, easier and more pleasant. Among the improvements, the plan calls for better sidewalks, more and safer crosswalks, more lighting for pedestrians, better and safer bike lanes and facilities, more trees to supply shade, bus stop improvements, pick-up/drop-off locations near stations and landscaping. Metro is an industry leader in supporting progressive programs to minimize potential environmental impacts resulting from the planning, construction and operation of one of the largest and fastest growing transportation systems in the nation. We’re building on sustainability As an international leader in environmental and sustainability practices, Metro created a Green Construction Policy (GCP) for its planning, construction, operations and procurement activities. As a result, Metro uses greener, less polluting construction equipment and vehicles, and has implemented best practices to reduce harmful emissions in all construction projects performed on Metro properties and rights-of-way. Construction equipment and activities account for a significant amount of air pollution; therefore, the EPA and California Air Resources Board had established phased-in standards to reduce the amount of emissions. However, all off-road construction fleets in California are not expected to meet the highest emission standards until 2029. In order to mitigate these impacts, Metro’s Green Construction Policy accelerates this timeline and requires Metro’s contractors to start using cleaner vehicles and equipment now. The policy, which was established in 2011, requires Metro’s contractors to use less polluting equipment and reroute construction traffic away from schools, daycares, playgrounds and hospitals. For the Crenshaw/LAX project, the results are significant. In 2017 only, PM10, ROG, CO2e and NOx emissions were 88 percent, 79 percent, 8 percent and 59 percent, respectively, lower than if the GCP was not in place. In other words, the reduction of PM10 emissions in 2017 was equivalent to removing over 15,000 cars from the road. Don’t go it alone The Metro Vanpool Program is one of the leading public vanpool programs in the country. To date, nearly 1,300 public vanpool routes are in service. These routes have recorded over 30.7 million vehicle revenue miles and delivered over 3.8 million passenger trips effectively, reducing the number of cars on the road during peak commute periods. These vanpools average 5.8 people per trip. Equity Platform The Metro Board of Directors approved an Equity Platform, a guide to ensure that Metro is considering all people as it plans, builds and operates mobility improvements. While Metro has always strived to be inclusive, our new platform moves equity to the forefront of decisions we make about transportation. This means that we can’t just assume a rising tide of transportation projects will lift all boats. Equity is about smarter planning, an increased commitment to environmental justice, more targeted public outreach and achieving better outcomes to improve access and economic opportunities for everyone in LA County — especially communities that have historically been left behind. Our Equity Platform is already influencing our NextGen Bus Study and our Long Range Transportation Plan. It also allows the agency to think and act more holistically as we impact and shape our community for the better.